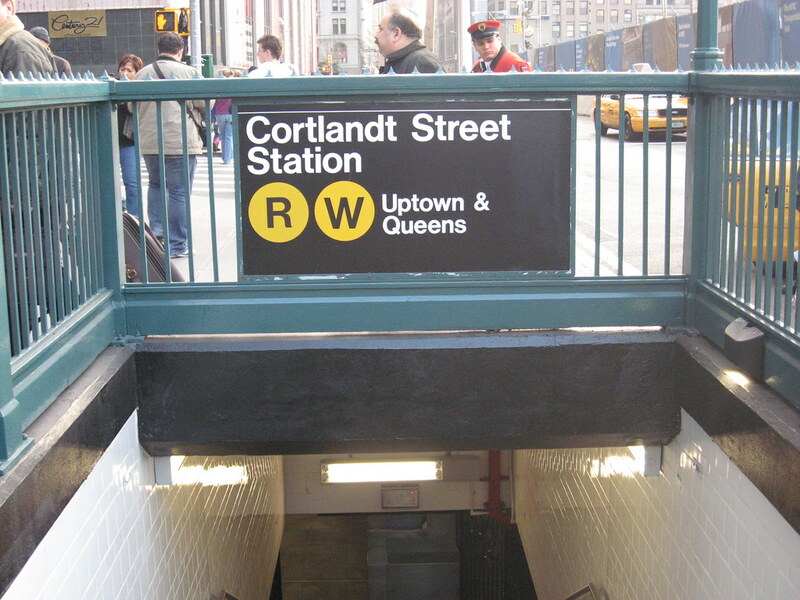 After four years, a northbound platform opens at Cortlandt St. When the Twin Towers fell on Sept. 11, two subways around Lower Manhattan were badly damaged, but the MTA sprung into gear. 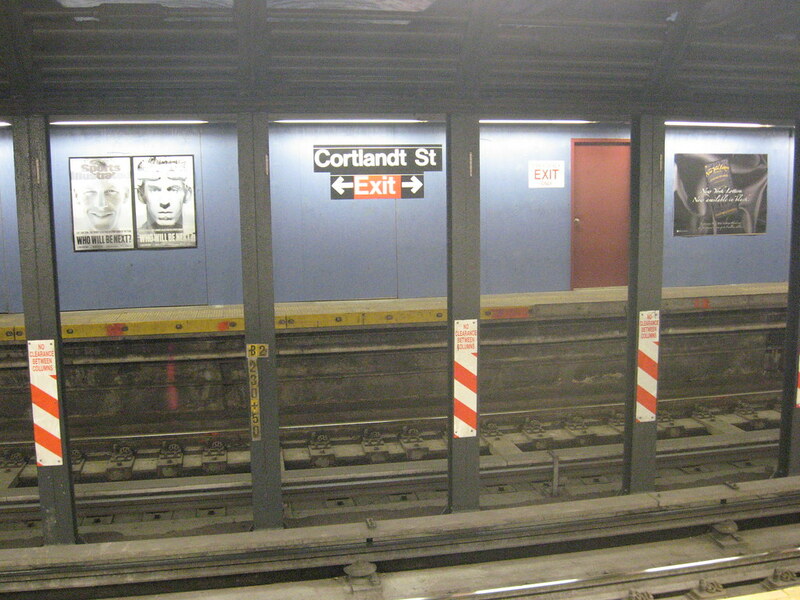 Although both Cortlandt St. stops were destroyed, the station along the R/W and the 1 line south of Chambers St. — but not its Cortlandt St. station — reopened for service on Sept. 15, 2002. In 2005, though, the R/W station was again shuttered, this time to make way for various projects around Ground Zero. 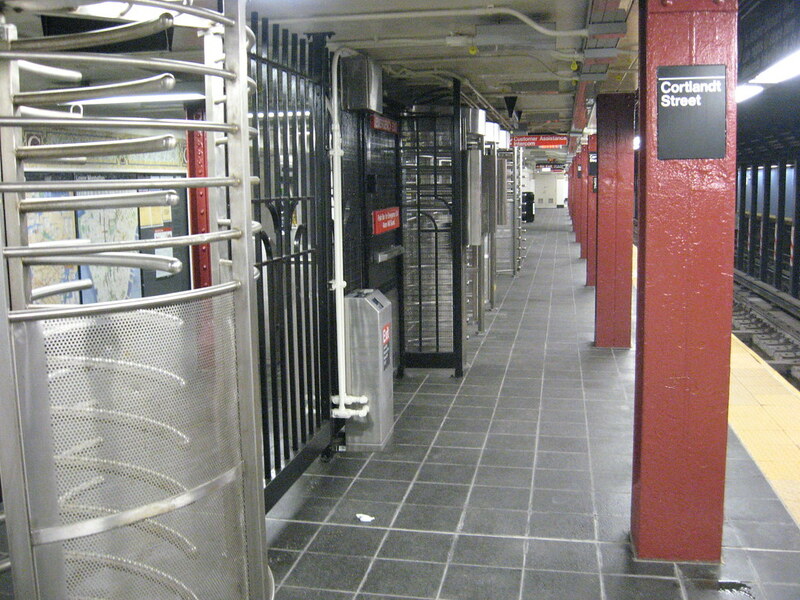 On Wednesday, one platform at Cortlandt St. on the BMT Broadway line — the R/W station right near Century 21 — reopened. Although the southbound platform will remain closed until Sept. 11, 2011 to allow for Port Authority construction of their PATH train hub, the northbound platform — sans the Fulton St. Transit Center’s Dey St. connection — is in service for the first time in four years. The new station isn’t a radical departure from the past as the new South Ferry is. Rather, Cortlandt St. features some basic improvements. The station, which used to service approximately 15,000 passengers a day, has wider staircases and platforms. The walls have been retiled, and the station is sporting a fresh coat of paint. As MTA officials and New York politicians gathered yesterday to celebrate the reopening, the station though remains dominated by blue construction walls. The southbound side is now fully encased behind blue construction walls, and what will eventually be the Dey St. Connector to the rest of the Fulton St. complex will not open until 2012. Still, politicians praised the gradual debut of pieces of the new Fulton St. Transit Center. 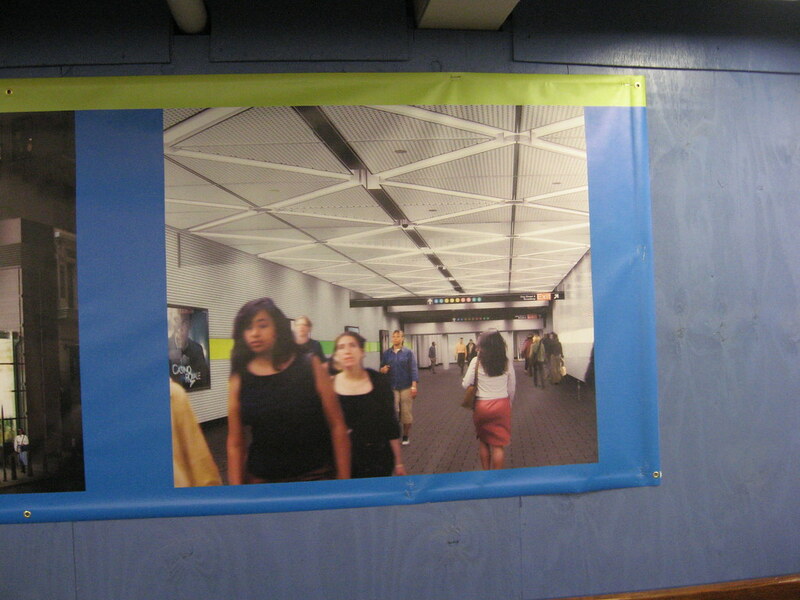 With renderings of the Dey St. passageway and eventual Fulton St. hub decorating the station, the Cortland St. platform is a welcome readdition to the Lower Manhattan transit picture. Slowly, slowly, progress builds apace. Click through for a slideshow from the new station. The R/W (then N/R) line was shut down briefly after 9/11, but it didn’t sustain major damage, and it reopened in late October or early November. The station itself, as you say, opened in September 2002. It closed again in 2005. The 1 line, on the other hand, was destroyed on 9/11. It was rebuilt over the next year and reopened in September 2002. The Cortlandt St. station on the 1 has not yet reopened – there would be no way out, since it runs inside the WTC “bathtub.” It won’t be reopened until there’s somewhere to exit to. And I don’t think it’s advisable to give a precise reopening date almost two years in advance. While that may be the goal, construction schedules are never that precise. Direct that to the MTA. In the press materials concerning the reopening of the station, they’re the ones saying the precise date. I fixed the inaccurate informatin in the first few paragraphs. In which press material does the MTA state that the station will, without a shadow of a doubt, reopen on September 11, 2011? The press release gives an expected (i.e., planned, or projected, or target) reopening date. And I think your opening paragraphs are still in need of correction. The 1 line (not just the station) was completely destroyed. I feel as though we’re arguing semantics here. The 1 line itself was not completely destroyed. The 1 still ran local from 242nd St to Chambers St. South of Chambers St., it was rerouted over the IRT into Brooklyn because the Cortlandt St. station was destroyed. As for the precise opening date, the MTA is targeting the 10th Anniversary of the 9/11 attacks. To miss that date would be politically bad. I’ll stick with my original wording. No, I’m making the distinction between damaged and destroyed. The 1 line in the World Trade Center vicinity (apologies if I wasn’t clear the first time) was destroyed. Not damaged, but destroyed. The current line in the World Trade Center vicinity was built anew in 2002. (Much like the Twin Towers themselves were destroyed in 2001, and the Port Authority is now working on replacing them, not merely on filling a few holes that the planes left.) That’s why it took a year before trains could even pass through the area. The N/R (now R/W) line in the World Trade Center suffered minor damage. Sufficient repairs were made in under two months to allow trains to pass through. It took a year for the station itself to be made ready for passenger access, either due to further repairs or simply because that’s when the sidewalks opened – I’m not sure which. But nothing on the line was destroyed – not the line itself and not the station. As for the date – I’m making a general journalistic point. You don’t know for certain what’s going to happen nearly two years from now to the day (nor does the MTA); why are you making it sound like you do? The MTA’s current plan or goal or target is to reopen the southbound platform on September 11, 2011, but things don’t always go according to plan. If construction runs late, it won’t be opening on September 11, 2011. If construction runs early and the platform is ready to be reopened half a year early, I doubt it’s going to be kept unnecessarily closed for half a year to preserve the symbolic date. And politics changes as politicians and leaders change. (A new NYCT president starts today!) You don’t know when the southbound platform will reopen – you only know its currently planned reopening date. But that’s not what your article says. I just used this station platform this morning. This has to be the cleanest station in the entire system right now. Kudos to the MTA to surprise us by opening this station platform earlier than expected. Question: If the Cortlandt St station had to be completely rebuilt, why didn’t they add elevators to it? I’m glad to see things are getting back to normal, but disappointed at the lack of accessibility. Will that be part of the Fulton St transit center project? Like with my earlier comment re: Columbus Circle, having never been down there before due to lack of wheelchair access, I don’t really know what the situation on the ground is with Cortlandt and Fulton St asides from what I can glean from this blog and maps. It wasn’t completely rebuilt. ADA retrofitting is expensive and is only needed at larger, more frequently used stations. The nearby E stop will have ADA access in the future. Actually, Kevin, ADA retrofitting is required for any project of this ilk. However, because the entire Fulton St. Transit Center will be ADA-compliant, the Cortlandt St. stop itself doesn’t require an elevator. Ah, so Cortlandt on the B’way lines will be accessible via Fulton St, you’re saying? Thanks :).